It’s the first day of March, and although spring isn’t quite here yet (I keep saying that spring is in the air, and Yvonne keeps correcting me) it certainly is getting greener outside, and St. Patrick’s Day is on the way – a very green holiday indeed. If some (or all!) 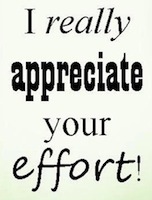 of your students have been working hard at school, why not reward their efforts? 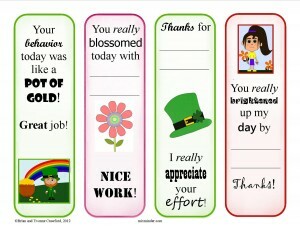 They’ll appreciate the recognition for their work and classroom participation, and it might even come in handy after those late nights spent under the covers with a flashlight, reading a favorite tale. It can’t hurt to make your students feel good about their hard work while promoting reading and literacy at the same time. Print out the attached PDF on card stock (for stability). If your computer doesn’t display PDF colors correctly (some don’t), here’s an image version. Write personal notes on the bookmark, if desired (note that some of the bookmarks require it). Cut out the bookmarks individually. 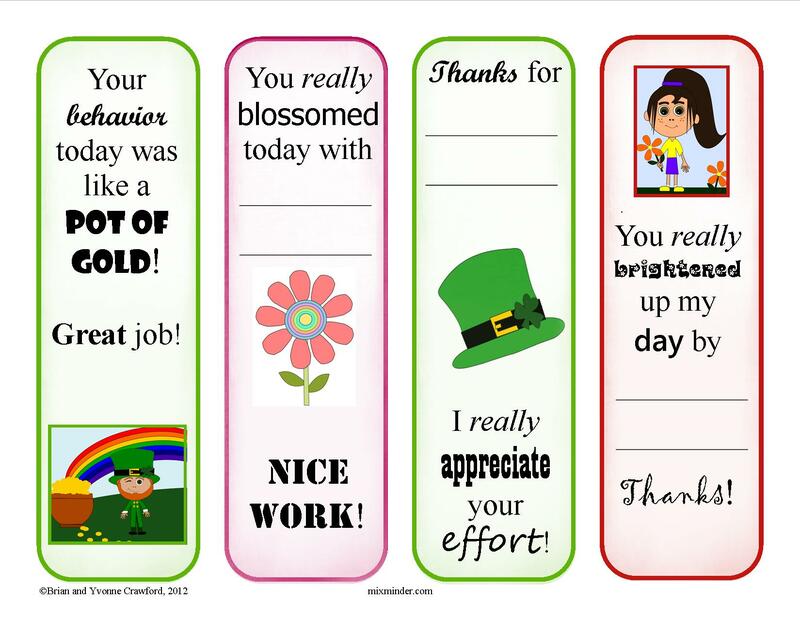 Present them to your students, either publicly or privately – it’s up to you how to turn the presentation of a classroom reward into a special thing.